Volunteers have been making the headlines over the past six weeks at the Olympic and Paralympic Games, with everyone saying that it was the volunteers who made London 2012 such a success. So I thought I’d take the opportunity to celebrate some of the volunteers at MERL who have been helping us on the A Sense of Place project, and say thank you for their help. Like many museums, MERL relies heavily on volunteers to help us get everything done. We have a wide range of volunteers at MERL – from students at the University, to special interest groups and local residents – and the University of Reading Museums and Special Collections Service (which includes MERL) was recently awarded the Investing in Volunteers Standard from Volunteer England. Click here to find out more about volunteering at MERL. Our project office is always bustling with volunteers. As well as regular volunteers who come in once or twice a week for an extended period of time, we also have interns who work with us more intensely for a shorter period of time, and work experience students who are with us for just a day or two. Different volunteers help us on different parts of the project. Ron and Carl are our longitude-and-latitude-looker-uppers. When we add a new place to our thesaurus, we also have to add the latitude and longitude so that it can be pinned to a map. At the start of the project we were taking our lats/longs from the Getty Thesaurus of Geographic Names but, as well as not listing many smaller places, we discovered that Getty wasn’t always very accurate with its coordinates. Since that discovery, Ron and Carl have dedicated a few hours a week to looking up places in GoogleMaps to find their coordinates. Carl also helps us track down the lats/longs of more specific places, like historic farms. Christina heads up ‘Team Polehead’. 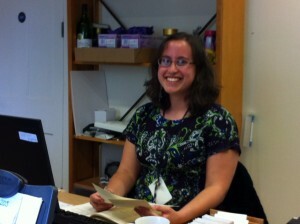 Christina has been volunteering at MERL for over a year and she is at the heart of Team Polehead. Following on from cataloguing the Shickle Collection, we’ve been trying to catalogue the rest of the poleheads (we have over 900 in total). Christina has taken on this task and is fast becoming an expert in all things polehead – she’s already done 280 out of 380 in the Allen Collection. She’s also been training up other volunteers to help her, which is a big help to me. As well as being a tour guide and doing volunteering in other parts of the Museum, David helps us with scanning one morning a week. 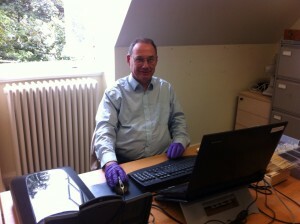 The majority of our volunteers have been working away since February on digitising our old black and white negatives. This was initially for the JISC project but, having met the target of 3750 scans, they’ve carried on. They’ve now done over 4800 scans of the 60 series negatives and 775 of the 35 series negatives. We’re hoping that they won’t mind carrying on, as it’s a great way to get images for Adlib without having to take new photographs (which are very expensive and time consuming). Team Negatives includes Stuart, Emma, Steve, Anna, Nina, David and Josh. 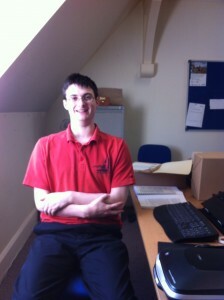 Matthew, one of the interns who has been helping us for two days a week for the past six weeks. Over the past six weeks we’ve had two interns from the archives working with us part time. Matthew and George have done various things to help us – a bit of negative scanning, some new photography, some transcribing, some polehead cataloguing etc. Matthew has also been scanning two folders of correspondence from the 1930s between Harold John Massingham and Mr Greening, a master carpenter from Winchcombe in Gloucestershire. Thank you volunteers!!! We really do appreciate your hard work!